Why do we need a bonsai humidity tray? That’s because it helps to maintain sufficient moisture around our bonsai trees. Actually, there’re still three more reasons I show you below. 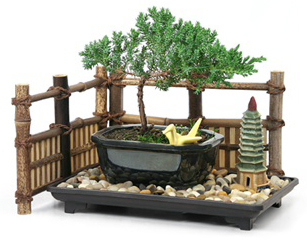 Humidity trays are water-filled shallow plates with gravel or pebbles, on which you place ur bonsai tree pot. Using a humidity tray is the perfect solution to keeping indoor bonsai trees and orchids happy and healthy. They provide necessary moisture by way of evaporation when plants are placed on top and kept indoors. Material: Humidity trays are usually made of ceramic, plastic and even marble. Sizes: Sizes range from as small as 6 or 7” in diameter, to as big as 2’. Shapes: Oval, rectangular, square, and round. Humidity trays are so decorative and add to the overall presentation of your bonsai work of art. Humidity trays acting as drip plates will catch any excess water that may drain from the drainage hole at the bottom of the bonsai pot. In that case, the tray helps to protect the surface of whatever you are putting the tree on (windowsill, table etc.). A little water in the tray all the time evaporates, which will create a humid environment for the tree 24/7. Instead of taking the tree to the sink to water it, you can simply water the tree in place. When watering in this way, pour water on top of the decorative pebbles slowly until it penetrates the soil and the excess water comes out of the holes in the bottom of the pot. This method of watering is particularly convenient for larger trees. Arrange a layer of pebbles or gravel on the tray, then slowly add water to it, and then place your tree on the pebbles. Remember to keep the roots from sitting in water, which could lead to root rot and will in any case harm the tree. Be sure to check water levels in the humidity tray frequently, and do not allow it to dry out. Remember that you need to have water all the time because it is the process of evaporation that provides the necessary amount of humidity to maintain the beauty and health of your miniaturized tree. If you are kind of do-it-yourself person, you can well make your own humidity tray. It’s quite simple. For visual reference, you want to watch below video clip on Youtube about how to make a drip tray. The lesson applies for both orchids and bonsai also.